Rain and wet roads can be dangerous. As temperatures increase and rainy season arrives, the importance of spring vehicle maintenance becomes more and more evident. Here are some auto tips to make sure your vehicle is up to the challenge. When roads are wet, tire traction is decreased. That can cause problems with stopping, accelerating, or turning properly. If your tires don’t have much tread left, water on the road can’t be effectively evacuated from between the treads blocks. This can cause a condition known as hydroplaning, whereby your tires are literally sitting on top of the water instead of being in direct contact with the road. Hydroplaning can cause a sudden loss of control and greatly increases stopping distances. Always have your tires and tread inspected by a trusted mechanic to ensure safe driving in all conditions. Remember, to always drive slower and be cautious if it starts raining while you’re driving. It goes without saying but, the more it rains, the harder is it to see. Even if your windshield wiper blades are in good condition, heavy rainfall reduces visibility significantly. It makes it difficult to see road signs & traffic signals, pavement markings, the edge of the road, or pedestrians walking. 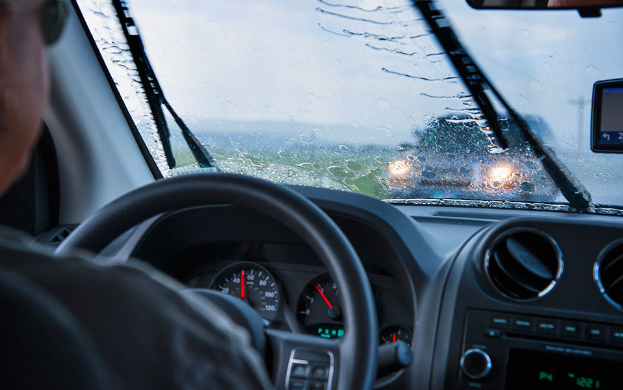 Make sure to check and replace your windshield wiper blades before the rainy season. Get your cabin air filter changed. Your car’s cabin air filter is similar to your home’s air filter. Replacing your vehicle’s cabin air filter increases the flow of fresh filtered air into the passenger’s compartment, which helps to reduce excess moisture buildup, preventing fog from forming on the inside of your windshield. With spring here, a rise in pollen allergies is imminent. Changing your car’s cabin air filter especially helps those who suffer from allergies and reduces mouldy airborne particles by filtering out pollen, dust, and other contaminants. Plan ahead, make sure your tires are in good condition with proper tread depth. Turn on your headlights to make yourself visible to others. Always drive using two hands and stay alert to your surroundings. Make sure to add extra following distance, allow yourself more room between other cars. Keep your speed reduced and maintain a consistent speed when making turns. Allow yourself more braking distance to ease into a stop. If hydroplaning occurs, do not brake suddenly or accelerate. Reduce your speed and steer slowly, straightforward until the tires regain traction. If it’s raining aggressively and your vision becomes inhibited, signal, safely move over to right-hand lane, and put your emergency lights on until weather clears. Ensure your car receives the spring maintenance it needs to be better prepared for wet and rainy weather conditions. Find your local Master Mechanic in your area, we care about you and your car!